Orto di Casa Cecconi: What a worthwhile pursuit to restore an orchard! 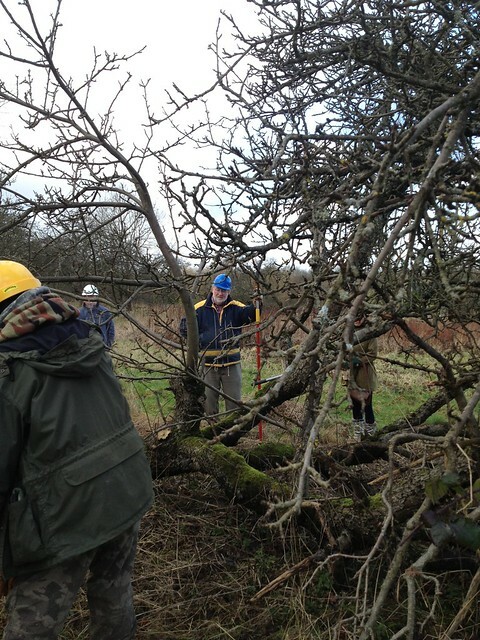 It was Twitter that brought that to my attention: volunteers required for an orchard restoration project. 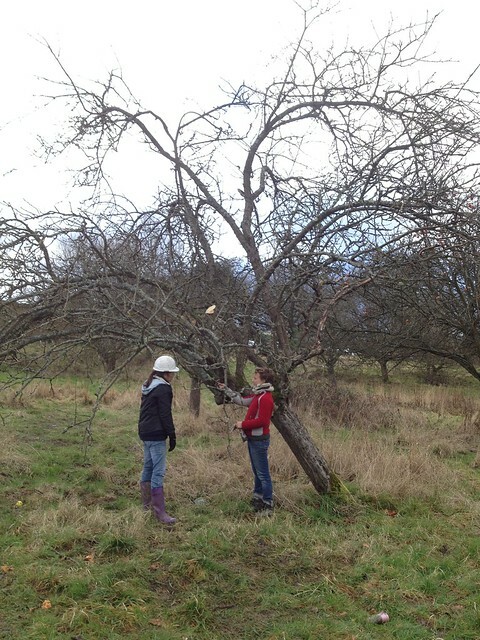 Restoring an orchards is such a worthwhile project. 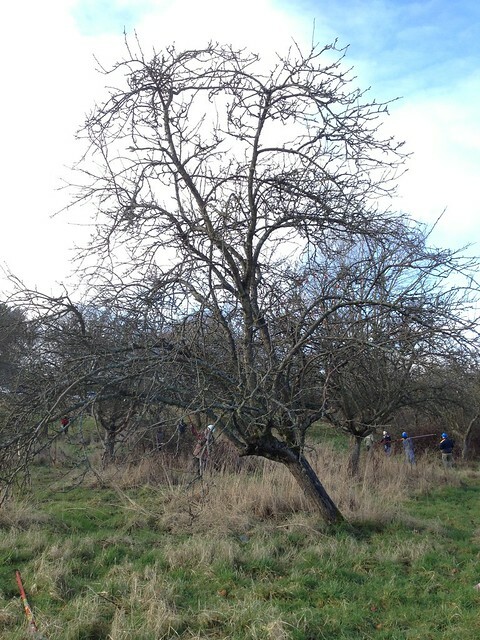 Appeals against the disappearance of the traditional British orchard have gone on for a while now, the NT and Natural England have long campaigned to save orchards as a matter of conservation: they are a wildlife heaven, besides providing us with healthy, local food. Don't you think it's crazy that most of the apples we eat nowadays come from the other side of the world, when Britan has such a rich history of cultivating our own, a country that in Victorian times had more varieties than anywhere else? There's that, and then you know I love pruning: there is nothing I enjoy more than restoring a badly pruned tree to a dignified shape. I had no professional experience of fruit trees though, so this sounded like a good opportunity to learn more, and it was indeed. Our very generous trainer was Bob Lever, orchard expert from Norfolk. The site Stanmore Hospital. The organisers: local Hoi Polloi project with the Urban Orchard Project. 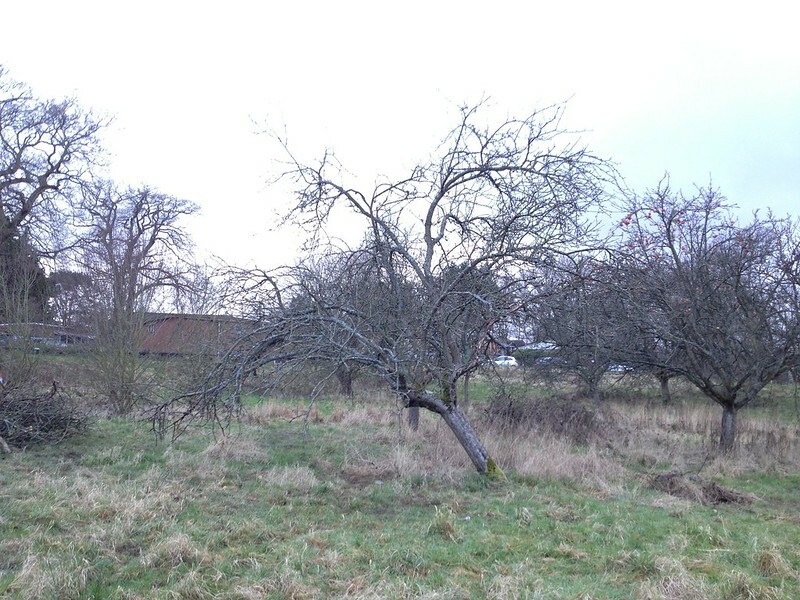 The old orchard, just behind the hospital restaurant, has gone neglected over the years and, as part of a community project, it is going to be brought back to life for the enjoyment of all (and to make delicious juice and cider, which we had the pleasure to taste). "A tree on top of a tree"
At some stage, all the lower branches of the apple trees - originally goblet-shaped - had been cut, and the plants had responded by pushing towards the sky, in some case creating what Bob called "a tree on top of a tree". That results in apples growing high up, and in productivity of lower branches going down. Besides, unmanaged trees tend to produce smaller, poorer quality fruits, but pruning can re-invigorate them. 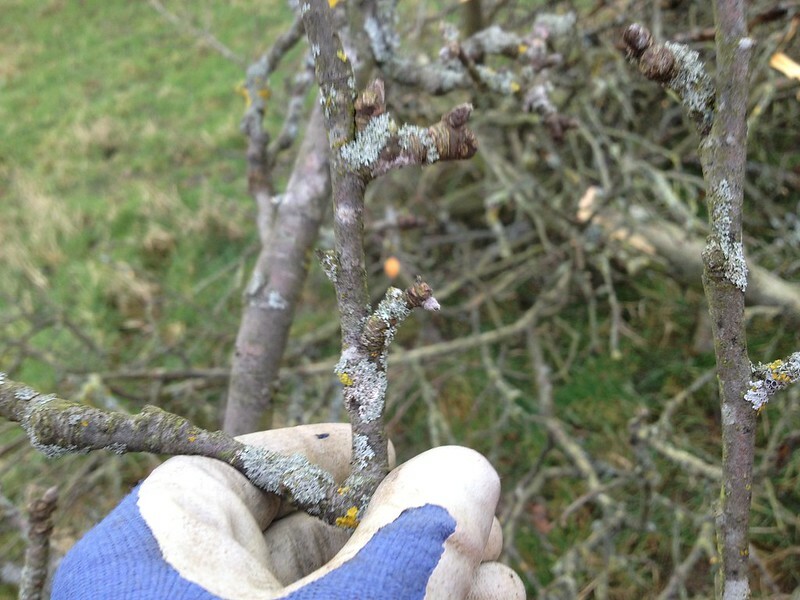 You can tell a branch has been left too long when there is lichen growing on the tips: as lichen is very slow growing, it means it had plenty of time to get established. Also, in this season, the fruiting buds should be rather big and plump (the leaf ones much smaller), but that was not always the case on the trees in that orchard, that had tiny buds. Our mission, as the first stage of restoration, was not so much to get rid of dead wood - which can be a good wildlife habitat (unless is obviously causing a problem to the plant or enabling access of pest and diseases) - but to start pushing the energy of the plant slowly backwards towards the lower branches, freeing the centre of the tree, so that more light could reach lower, and to relieve some of the trees - which, at their respectable age, start to get hollow in the trunk - of some excessive weight. The fascinating thing is that the hollow inside the trees is actually quite beneficial to their longevity, as it makes the wood more flexible to the tensions of growth. 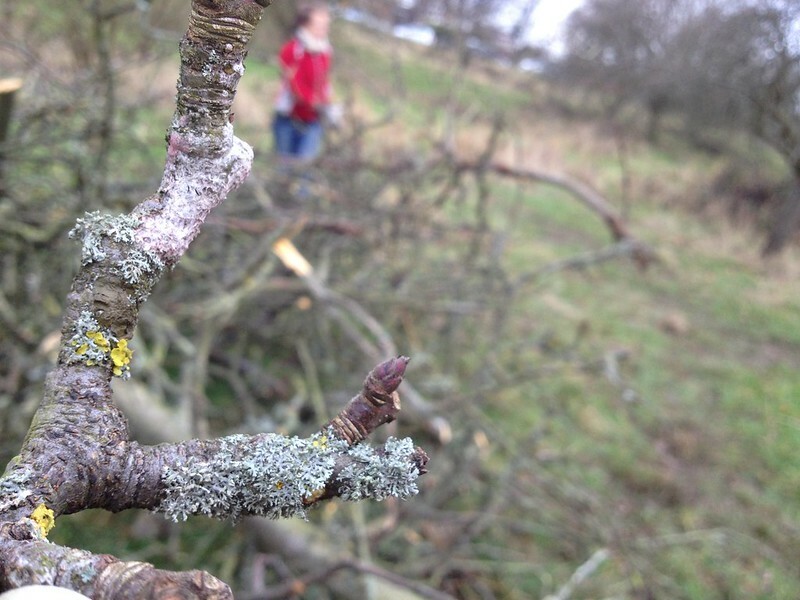 And most fungi growing on apple trees feed on rotting heartwood, so they pose no threat to healthy trees. But too much weight is too much. 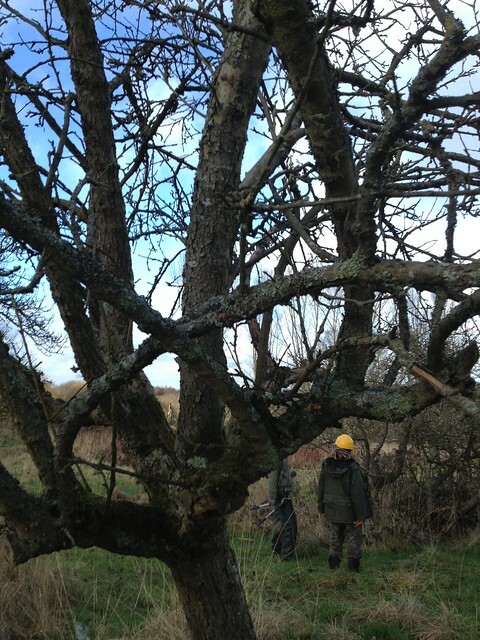 Bob suggested we take no more than 20% of the branches (plus any dead wood in the way), as trees that are pruned too hard push out vigorous vegetative growth at the expense of fruiting, and usually send it up almost vertically, at awkward angles that make the union rather weak. Incidentally, the most productive branches tend to have a 45° inclination. "Phoenix trees" is another term we got to learn from Bob: it describes a tree that has fallen on its side, from which the side branches have taken over as a new tree - almost rising from the old tree's ashes - to give it another lease of life. Phoenix trees only have part of the rootstock still in place, so they must not be left to grow too big, and they are actually sitting on the fallen trunk, so cutting it away is usually a bad idea (if anything, it should be propped, especially if there is a chance someone might be tempted to climb over it). Giving more space for the young, healthy branches, and clearing around the tree for easier maintenance were the suggested interventions. After such great introductions, we worked in groups on individual trees. I had a great time, teaming up with lovely volunteers Amy and Sue: we got to work on two trees, establishing a routine that got us quite far! In fact, one of the trees we worked on was the "tree on top of a tree" (in the picture above) from which we removed a large crossing branch, mostly dead, and an even larger vertical branch that was causing excessive weight on a tree that was already leaning. 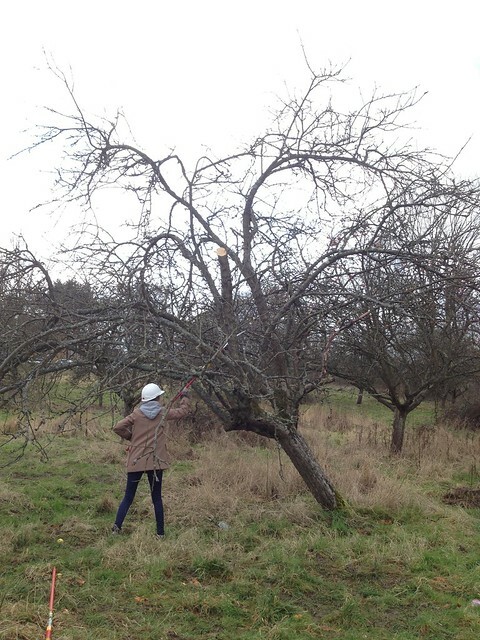 At the end of the day, and just before it started raining the usual torrents, we were proud to have pruned the apple tree to a much more proportionate, less top-heavy shape, that over the next three to four years can be restored to production and be enjoyed by the community.